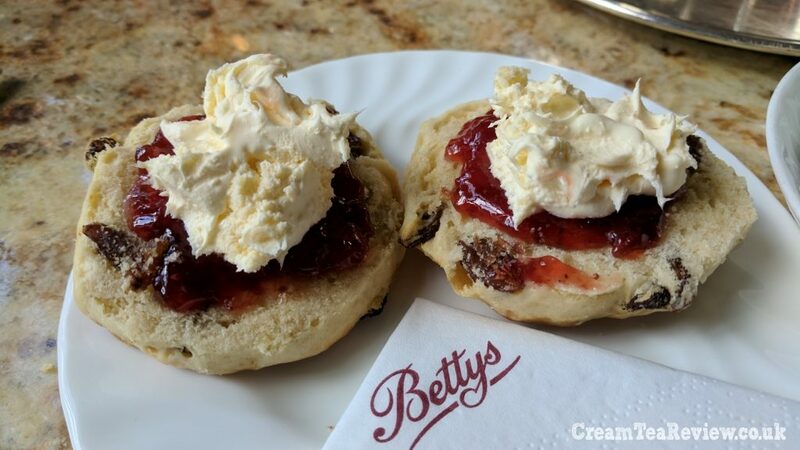 The scones served in a Bettys Cream Tea (or Afternoon Tea) are medium in size and fruit in variety. They were light, slightly crumbly with plump sultanas and delicious. Our only quibble, is that they are always appear to be served pre-cut in half. We really prefer to cut, or break the scones apart ourselves. 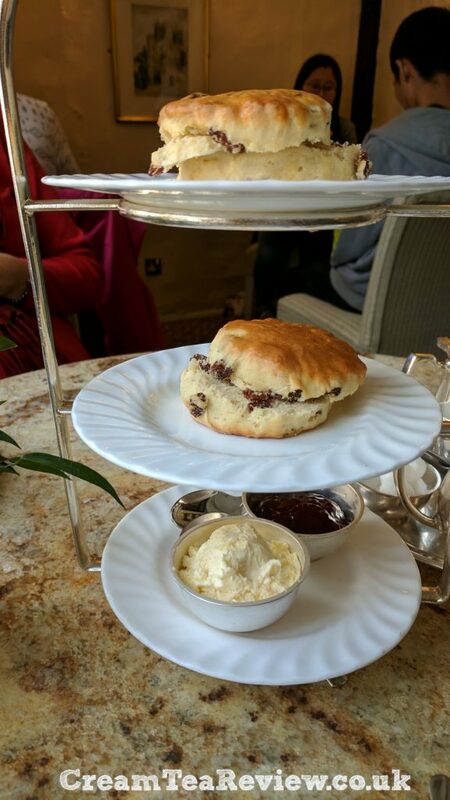 The delicious clotted cream was served in a small white dish and was just enough for the two scones. Strawberry jam was supplied as default. It was a good quality preserve with plenty of fruit and was sufficient for the four open scone halves. 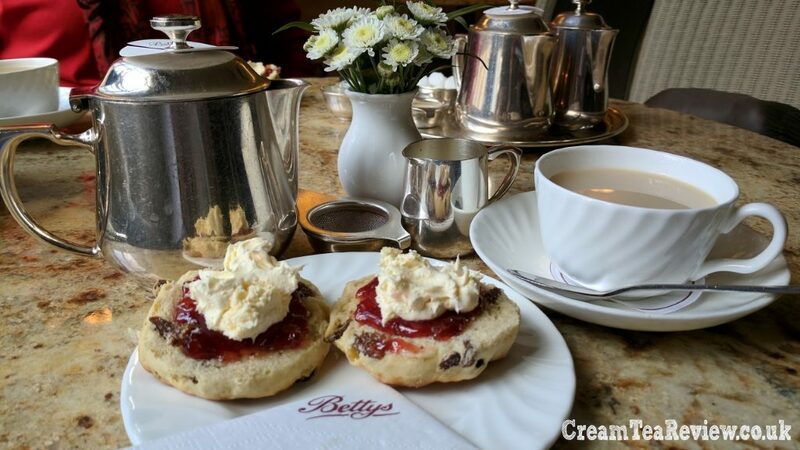 As you might expect, Bettys has a great choice of loose leaf teas. 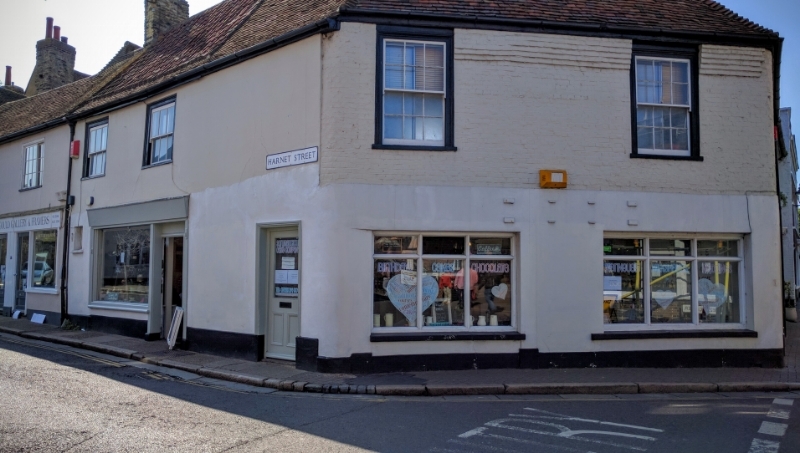 Sadly, they no longer offer our favourite Lapsang Souchong, but the Earl Grey we selected provided a lovely brew. We also chose a pot of their Blue Sapphire which was even better! 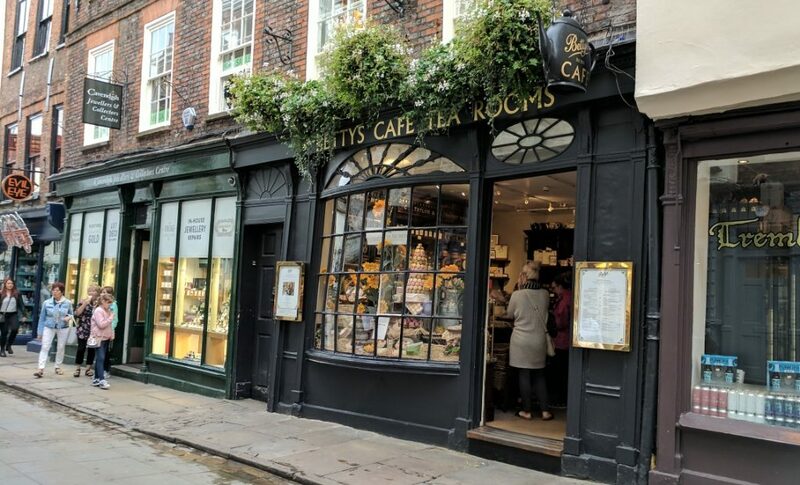 There are two Bettys in York — the large, elegant tearooms in St Helen’s Square (which had people queuing around the corner to get in) and a smaller, more intimate shop near the Minster on Stonegate. 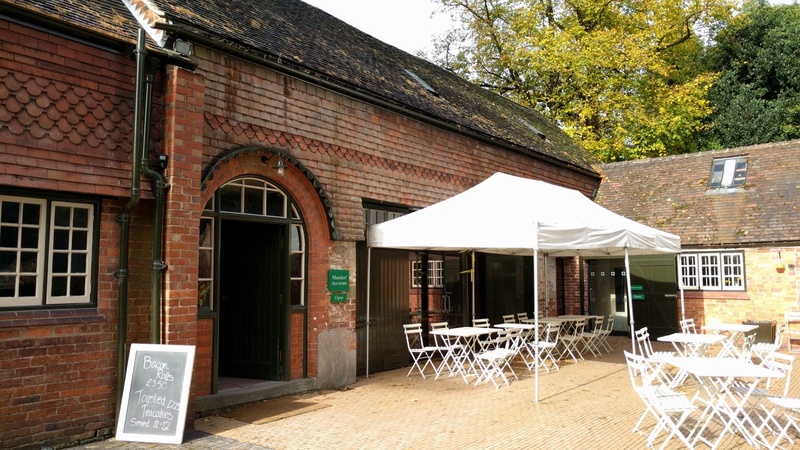 We opted for the latter, which was also very popular on the Friday lunchtime we visited. 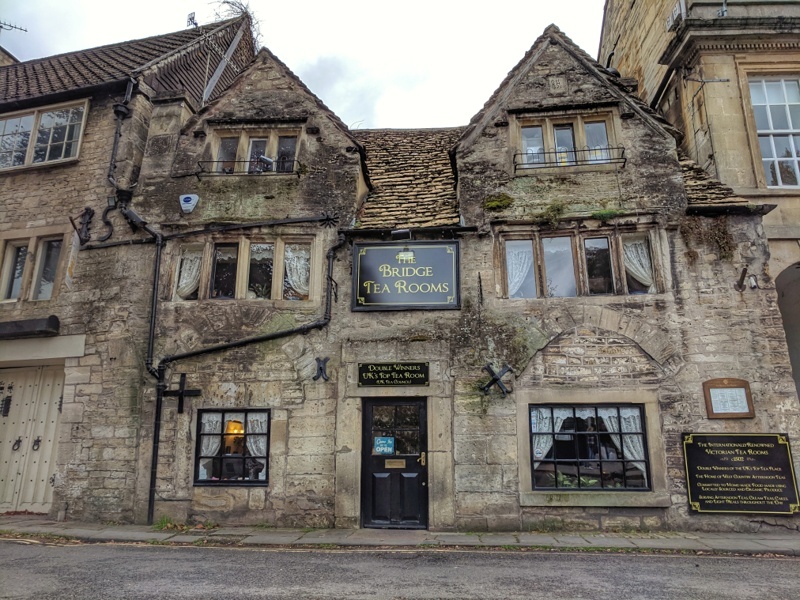 Despite the constantly busy turnaround of customers, the staff couldn’t have been more friendly, accommodating and keen to make each visitor’s experience feel special. The presentation was excellent on the marble table, with bright white Royal Doulton china and silver tea service.